Every Wednesday experience the unlocking of secretes to success, how to handle the worst and the best life throws at you. Get past The Pretty ; the glitz and the glam that many see on social media. The Ugly;the bed rock beginnings and hard times that are difficult that make you question your path. The Grind; the hustle the sleepless nights that no one see’s which develops The G Code’s; life lessons which fostersSuccess. Get ready for The G Code. Unlocking all Go Getta codes to success. 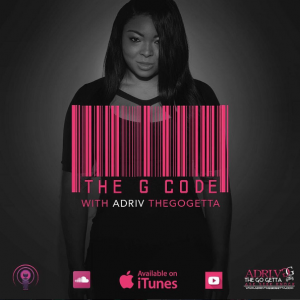 Checkout The G Code Weekly With ADRI.V The Go Getta for a dope motivational message and meetings with featured Go Getta’s as they give you the G Codes to Success. Get to know The Pretty, The Ugly, The Grind of Success every Wednesday!